Theatre-wise I have had a rocking last few months. First there was Andrew Lloyd Webber’s “Phantom Of the Opera”, one of the most popular Broadway musicals (Read the review here – and if you are one of the (very few!) regular readers of TalkingTails and have not read it, then I would like it it you did.. thanks!). More recently I saw the Madras Players’ Production of Chetan Bhagat’s “Five Point Someone” (Reviewed here). 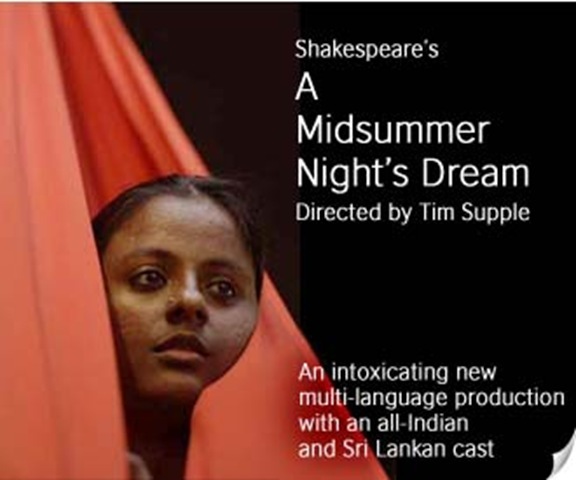 Yesterday I saw Time Supple’s A Midsummer Nights Dream presented by The British Council (Calcutta) in association with The Telegraph and Reliance ADAG Group and staged at Kala Mandir, Calcutta. The production is a multi-lingual adaptation of Shakespeare’s original wedding play. It is a romantic comedy set in a fantasy-like forest featuring Athenian lovers, fairies and a group of actors. To further complement the multi-cultural, multi-lingual cast and sets, the music, performed by a 4-member live orchestra had some of the best percussion pieces I have been privy to in my limited experience. It had influences from Indian tribal beats, Carnatic music and Baul folk songs form Bengal. I must confess I am a nobody as far as judging theatres / productions is concerned. What struck me the most however, was the whole concept of multi-lingual theatre. It has mass-appeal.. definitely! Besides, it showcases the power of Creativity – the power to collaborate and bring together disparate sets of people – emphasizing that no matter what the language, medium or circumstance – human emotion and reactions to it are the same. Only the expression is different. I wish I had enough time to “Google” and “Wiki” about the play. I would have done a lot more justice to the opportunity! Awesome. They had performed here in Bangalore a few days back, but unfortunately I wasn’t able to go. This whole concept of multilingual theater is interesting and intriguing. Can only comment on it when I see it. hmm.. multilingual theatre.. i dont have any idea about it but still i can make 1 thing out is multilingual theatre does include some excellent acting skills for it to be understood by people of different origins and linguistics!! Yupp… totally.. You should. Whether you like it or not is a different thing but it will be quite fascinating to watch! Bang on! … Sometimes even looking at the expressions and manner of speaking i could kinda guess what he must eb saying in Tamil, Malayalam etc… Taking into account the context of the play, of course! I had gone to watch the play yesterday and it was incredible. perhaps you should go theatrewise for the play five guys named moe. they are from england, now in germany and perhaps then in india. go for it. Good you went for it. Incredible it is!.. Especially the energy of the actors and the colourful and wholistic use of stage! I’ve started doing some “free” musicals/plays but the ones at the Kennedy Center are prohibitively expensive. 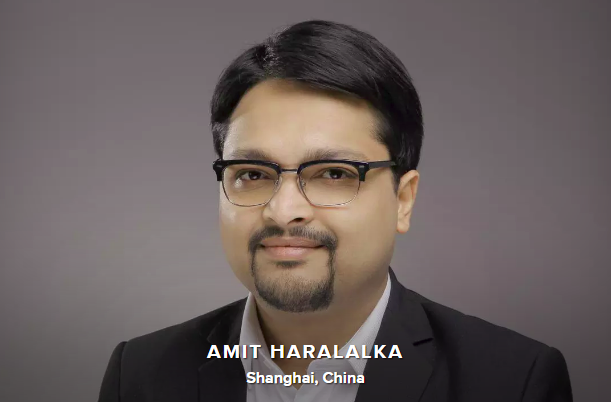 How are the plays in India? As in the cost wise? In India, theatre tickets can cost anywhere between 200 – 500 … roughly… im sure there’d be exceptions on either side of it! Hi! I just got home from seeing this production in San Francisco. It. Was. Fabulous. 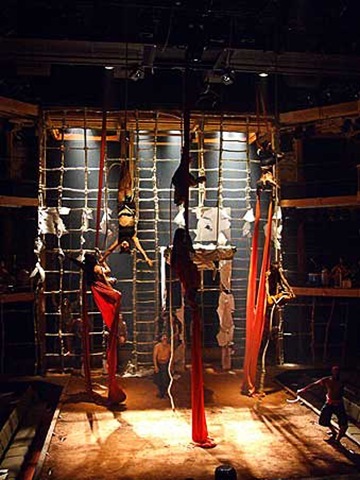 The sets are wonderful, and it was so dynamic physically (which makes a lot of sense for this story, what with all the upheaval and running around in the woods) – the acrobatics on the ropes and fabric and bamboo frame were just amazing, and I love the sparseness of everything else in contrast. The music were like another character, and really reminded me how well-done orchestrations help to tell a story. And the ensemble…I only understand one of the languages spoken (English), but felt that the performances conveyed everything they needed to. It reminded me of watching opera, which is usually not in a language I understand, but loses nothing for lack of translation. The passion and comedy came through in all 7 languages. I can see how some might find it challenging, but that’s not a bad thing, in my book. So glad I saw this! Indeed.. the energy totally grips you! — and what I also particularly liked are the very ethnic, Indian drum-beats.. The music was very well ‘connected’ to whatever was happening on-stage..
Do you remember the TV table tennis game from the late 70’s. In fact, they are chosen to “make you laugh and then make you think. Earlier today, the Norwegian Nobel Committee declared Liu Xiaobo the winner of the 2010 Nobel Peace Prize. post and a all round enjoyable blog (I also love the theme/design), I don’t have time to browse it all at the moment but I have book-marked it and also added your RSS feeds, so when I have time I will be back to read a great deal more, Please do keep up the great job. Thanks for any other informative site. The place else may just I am getting that type of info written in such an ideal approach?